It was nose to tail shark action this weekend! 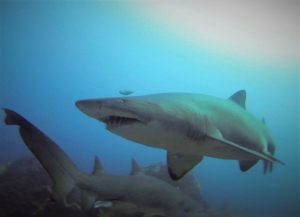 Julian Rocks was packed with Grey Nurse Sharks, we saw at least 30 sharks, most of them behind the Cod Hole and on the deep Eastern side. At times it was shark traffic jam and we had to wait to squeeze through… Join us for a dive next Saturday while Grey Nurse Shark season is still at its peak!